WinWeb’s OnlineOffice Web Hosting compatible with Microsoft FrontPage. Microsoft’s FrontPage, a copyrighted product of Microsoft Corporation, is one of the most popular html editors, site creation and management tools used by millions of people and small businesses world-wide to create their online web-site. Microsoft FrontPage is available as a stand-alone application or as part of Microsoft Office, which includes Word, Excel, and other productivity tools. WinWeb’s OnlineOffice has a build-in free web-builder application software to create and mange business web-sites, online shop builder software including shopping card software and online payment module. Microsoft FrontPage and WinWeb Web & Online Shop Builder, have some of the same functionality, the former is only available off-line while the later is available online, anytime and anywhere. 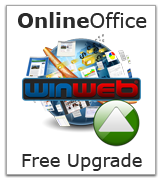 As usual this upgrade to WinWeb’s OnlineOffice Suite is free for all OnlineOffice – Standard & Pro Edition – users.